The Energy Project gave us an opportunity to contribute to environmental improvement by reducing the levels of electric power consumption required by our business activities. Our objective was to become a more efficient business while at the same time reducing our impact on the environment. Throughout the project The Ramsey Timber Group was supported and advised by the Carbon Trust . Jonathan Hutchinson, a geography undergraduate from Leeds University, tackled the reduction of our energy costs over an eight-week internship. During this time he managed to identify ways of reducing our operating site’s electricity consumption by around 30 per cent – a remarkable achievement. 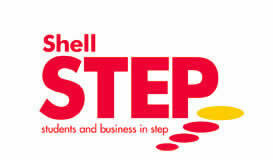 As a result of his work and the energy savings he achieved for Ramsey Timber Group, Jonathan achieved second place in Shell Step’s national competition to find the most enterprising graduate in the UK for 2009. The direct impact of his endeavour was to reduce our carbon emissions by 240 tons, which equates to the average annual cost of 67 domestic fuel bills. 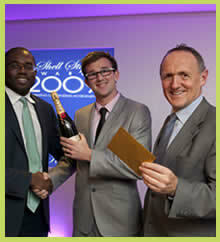 Jonathan Hutchinson receiving his prize from David Lammy MP (left) and James Smith (right) Chairman, Shell UK Ltd.
Part of the extraction network that was retro-fitted with 17 pneumatic dampers. This helped save energy across the network, by reducing the duty cycle of fans during machine downtime.